Are you in need of help focusing? Do you ever walk into a room and then forget why you’re there? Or is social media so much of a distraction at work that you can’t even complete your daily tasks? If you’re like most of you, you might be a bit sceptical of mind supplements. Perhaps you’ve read online that they’re a complete waste of time, or perhaps you’ve even tried a few and had bad experiences? Well, we’re in the same boat as you. We’re looking for the perfect nootropic that will allow us to have a calm and keen mind, yet without heart palpitations or nasty stomach upset. During our search, we found Nootrobrain. What first attracted us to Nootrobrain was the sheer amount of reviews online. This nootropic is very popular amongst the nootropic nerds and appears to have quite a loyal following. So what’s so special about it? If one supplement could attract such a large amount of buzz, there must be something interesting about it, right? Well, we chose to start out our study of Nootrobrain by looking at its website. The supplement Nootrobrain is sold by a company also called Nootrobrain. The website is pretty standard, but uniquely enough, Nootrobrain has a description on its website explaining what the word nootropic means and elaborating on history. If you’re curious, acoording to Nootrobrain, a Romanian doctor invented the word, which is an amalgamation of ‘nous’, meaning mind, and ‘trepein’, meaning bend. Certain nootropics can function by providing neurochemicals to the brain, thus increasing the amount of neurotransmitters and as a result increasing cognitive function. Other nootropics increase blood flow to your brain, or even protect your brain from injury. While the introduction and history lessons are incredibly informative and useful, we’re interested in the nootropic Nootrobrain. What exactly is in Nootrobrain and what will it do for our minds? According to the company Nootrobrain, the nootropic Nootrobrain (talk about a tongue-twister!) provides deep focus with only four ingredients. Since a few recently reviewed nootropics contained fifteen or even over forty, we were a bit taken aback by such a low number. But if you remember, in nootropics the ‘everything but the kitchen sink’ method isn’t generally suggested, so many there really is something magical about the combination of these four ingredients! The first ingredient in Nootrobrain is aniracetam. Aniracetam is a lipid-soluble chemical that is believed to have potent nootropic effects. It is a member of the racetam family, which are similar synthetic compounds that have mind-altering effects when consumed. While human studies are lacking, users have reported that aniracetam may enhance one’s ability to be creative and at the same time lower levels of depression and anxiety. Some people have said that by taking aniracetam, they were finally able to complete thoughts more easily, or in other words, put the pieces of puzzles together in our mind more quickly. We did find evidence that some teenagers might take too high of doses of aniracetam, but the level of aniracetam in nootrobrain appears to be completely safe. The next ingredient in Nootrobrain is CDP-choline. When CDP-choline is consumed, the levels of uridine and choline are increased. We read online that many people take CDP-choline as a means of preventing and treating age-related memory loss, but it is also taken by younger people. There is new evidence that younger people may perform tasks better and faster while taking CDP-choline. So far, Nootrobrain seems like it has pretty powerful ingredients, but what else might it contain? Third on the list is vitamin B-6. Vitamin B-6 is vital for normal bodily function. Our bodies need B-6 in order to produce norepinephrine and serotonin, both of which can enhance one’s mood and help one escape from depression. Vitamin B-6 also aids the production of hemoglobin. Hemoglobin provides oxygen to our brains, and low levels of hemoglobin may prevent us from thinking quickly and clearly. A bottle of 60 capsules costs $79.00 and can be purchased online. The company does offer deals such as: Buy 2, Get 1 Free for $134.00 and Buy 3, Get 2 Free for $201.00. If you are not ready to commit to the company just yet then we would recommend buying the regular bottle. Just under $80 a month is pretty expensive compared to other supplements, but we leave it up to your bank account to decide. 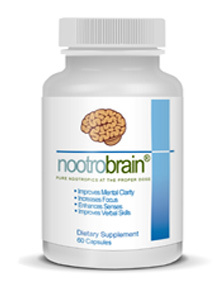 Overall, Nootrobrain sounds like a pretty solid supplement. We found several positive reviews online, but we also found some negative ones. It’s a toss up really, but from what we’ve seen, Nootrobrain seems pretty harmless and may just give you some relief from your foggy brain.